To select a different stylesheet: press ALT, then V, then Y; then select the stylesheet you wish to use. If your browser does not support alternate stylesheets, please download Mozilla Firefox. Firefox supports many accessiblity features including stylesheet swtiching. Are you a professional presenter? By that I mean are you presenting during working hours and getting paid for it? Do you want to improve your presentation skills? You've found the right place. It has been estimated that, worldwide, thirty million presentations will be given today. Millions of those will fail. Millions more will make no impact whatsoever. A Small number will be memorable. The consequence of a mediocre presentation can be hugely detrimental. In our one day workshop, we transform mediocrity into professional excellence. If you want to become a better, more professional presenter and improve your writing format this is your opportunity to sign up for our workshop. The focus of our course is to make your use your brain more efficiently without the use of the various brain pills available today. Hello, I'm Patrick Tansey. I have been a professional public speaker and presenter for over 30 years. Organisations engage me to speak at their casino and gambling conferences and business meetings. Perhaps you have heard of me or even seen me in action. I speak at an average of 100 events every year, and regularly get re-booked. I am also founder member of the Professional Speakers Association. If you want to become a more polished, more professional presenter, this is your opportunity to sign up for our workshop. 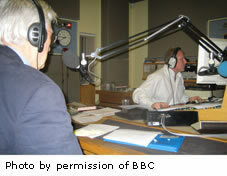 Patrick (on left) is a regular contributor on BBC radio. He is called in when the BBC requires a subject matter expert (SME) to discuss topics such as Public Speaking; Work/Life Balance; Humour as a Business Tool; etc.